A discussion of work on view November 8 – 27 by visual artists Melanie Baker, Margarida Correia, Shaun El C. Leonardo and Dionis Ortiz, all graduates of the NYFA Artist as Entrepreneur Boot Camp. An evening of jazz with NYFA Artist as Entrepreneur Boot Camp graduate Travis Sullivan and “Bjorkestra,” his genre-bending homage to Icelandic pop star Bjork. Singer-Songwriter Stephanie Spangler performs original pop-folk songs played on the piano. With special guest Peter Cobb on Sax! Soprano Gretchen Farrar performs Spanish and English songs for voice and guitar from Interweaving, her upcoming CD. Filmmaker and NYFA Artist as Entrepreneur Boot Camp graduate Michelle Chai offers an evening not of film, but of salsa. Following two short performances—a solo work performed by Michael Belmonte and a partner dance performed by Chai and Belmonte—Chai offers a 45-minute salsa lesson. Samples of her clothing line will be available for sale. LaunchPad, located at 721 Franklin Ave in Crown Heights, Brooklyn and owned and operated by Mike Kunitzky, has been a generous host for several NYFA Boot Camp Arts Festival events. Check out a great story on the space and check it out on Saturday, Nov. 13 at 7pm for the Festival’s next live performance featuring Wanda Phipps, Liliana Almendarez, Ryan Murdock, and Stephanie Spangler. There are dozens upon dozens of resources for artists out there, but which ones are useful for realizing projects? Here are some recommended resources by four Boot Camp artists who recently spoke at our NYFA Artist Talk. 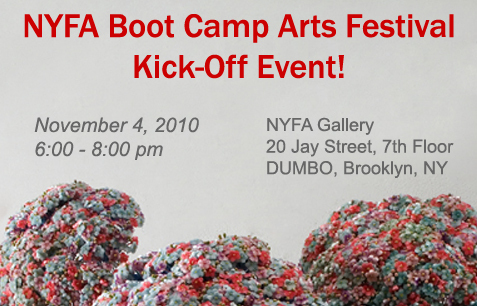 We’re looking forward to seeing everyone at the Kick-off event tonight at 6pm at the NYFA Offices. There will be a fantastic exhibition showcasing many Boot Camp visual artists. NYFA Curator David Terry will speak on the exhibit. Come join us and mingle with the Boot Camp Artists and friends. Complimentary wine will be served. The NYFA Boot Camp Arts Festival organizers are getting the final pieces in place for the Festival! We’re revved up here at NYFA and here are some preview pics representing several of the artists who will be showcasing their work throughout November. Boot Camp Artist Featured in The Uptown Chronicle! Check out a recent post on one of our Boot Camp Artists, Dionis Ortiz, in The Uptown Chronicle. He is part of a Festival show, Identity: Masked and Unmasked, at LaunchPad along with Melanie Baker, Margarida Correia, Shaun El C. Leonardo. The show opens Nov. 8th at 6pm (see Schedule of Events for more details). Exhibit is curated by Rachel Selekman.